South Korea Climate - explore Seoul weather and the changing of the seasons and seasonal events, festivals and customs of South Korea. The climate here is temperate and is split up into four different seasons. 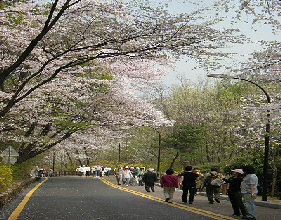 Essentially, the most tourist friendly seasons here are Spring between April and May, when the cherry blossoms are in full bloom as well as Autumn from September to November when the skies are clear, sunny and warm. Spring and Autumn which are pleasant but short in duration provide a welcome relief from the extremes of summer and winter. If you love the beauty of the cherry blossoms, you will need to be there in Spring but just note that Spring is also the time of the wet monsoon rains and can often come with gusty winds carrying yellow dust from Northern China. Around mid-April, you will enjoy the balmy weather of South Korea climate with the mountain and field garbed in brilliant wild flowers. Farmers prepare seedbeds for the annual rice crop at this time. The rainy season, also known as 'changma' season starts in late June and lasts through mid-July and often causes flooding of low areas. The best time to visit is during Autumn where the South Korea climate is the best - beautiful with crisp air and blue skies. The countryside is amazingly colorful in a variety of mellow hues. This is the time for harvest and consequently the time for thanksgiving. Autumn in Korea is a delightful season featuring many folk festivals rooted in ancient agrarian customs. Winter starts in late November and lasts until early March. You will need to dress accordingly and especially wrap and snuggle up as it can be pretty cold - we found out the hard way - often going into minus degrees which is ideal for skiing and winter sports. It is dominated by a high pressure zone caused by cold blasts of air from Siberia. There is little precipitation and the skies are usually clear. Snow is picturesque but temperatures can range from a low of -15 degrees celcius ("C") in winter to a high of 34.7 degrees C in summer. Seoul's mean temperature in January is -5 degrees C to 2.5 degrees C; in July, the mean temperature is about 22.5 degrees C to 25 decrees C.
Because of its southern location, Cheju Island has warmer and milder South Korea climate than other parts. Mean temperatures on Cheju range from 2.5 degrees C in January to 25 degrees C in July. The country generally has sufficient rainfall to sustain its agriculture. There is rarely less than 75 centimeters of rainfall in any given year and for most parts of the year, rain is over 100 centimeters. Amounts of precipitation however can vary from year to year. The three months of June, July and August have the heaviest rains, with July usually being the wettest month of the year. South Korea is less vulnerable to typhoons than Japan, Taiwan and the east coast of China or the Philippines. One to three typhoons can be expected per year. Typhoons usually pass over South Korea in late Summer especially in August and bring torrential rains which can cause considerable damage.